we didn’t know who had won……..
Last year during the lull in winter competitions, we decided to have a fun challenge between teams representing the Captain and President. 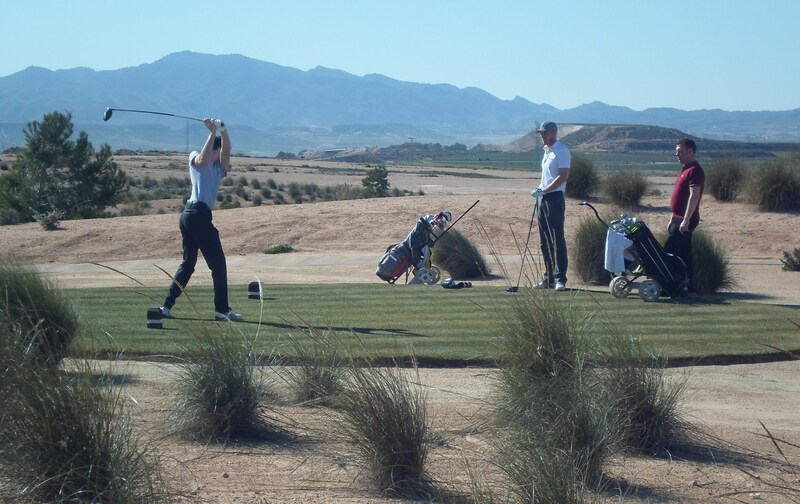 The format was matchplay pairs, with both members of the teams adding together their individual stableford scores. (Teams were drawn out at the roll up meeting). The worst score from each team was discarded. Also there was 5 points at stake for the winners. It was fun, with no entry fee and simple ribboned medals for the winning team. This year we tweaked it a bit, taking away the individual player totals which perhaps did not reflect the team ethic and perhaps glorified the good players and denigrated those with poor scores. This years format was purely matchplay, with one player keeping score for both teams. All that went on the card was a ‘W’ at each hole where a victory was gained by one team or the other. No recording which player won the hole, only the team. So thus if a hole had been lost, just forget it and try and win the next. With no extra points for a team win only holes won counted for the overall result. So each match had to played out until the 18th and no one walked in if they were 3 up with 2 to play etc. When the draw was made on Wednesday it looked as if Kevin’s team were the strongest on paper. The initial scores backed that up with 4 of the first 5 matches going to the Captain. Each victory was cheered by teammates sat in the sunshine on the upstairs terrace. But myself and Kevin had agreed that scores would not be made public until the presentation later in the Clover. Only Graham had exact information on how the scoring stood in the 9 matches. It became obvious that the Presidents team were making a rousing fightback in the later games and it started to look as if the result would be in doubt. The final match proved to be the decider. 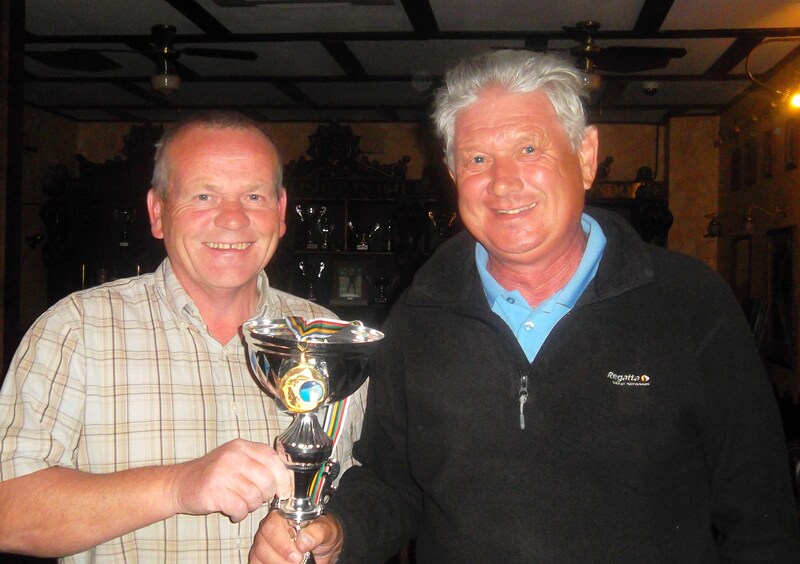 We allowed two late entries (Peter Reeves and his good friend Peter Mitchell) to play each other in a singles matchplay. Kev kindly let me have the choice of player, and I chose the ever steady Mr Reliable Peter Mitchell over the unpredictable streak player that was the ex-professional footballer, Peter Reeves. After analysing the cards afterwards it showed that with only the last game to be finished the Captains team was in the lead by only ONE hole. With Mr Mitchell playing his usual steady game and Mr Reeves having his usual disastrous first nine holes, at the turn the Presidents team were now in the lead by ONE hole. But the footballer showed his fighting spirit, and as he has done many times in the past showed his mercurial qualities by putting in a great back nine. After halving the 10th, the maestro won the next 6 holes before losing 17 and halving 18. 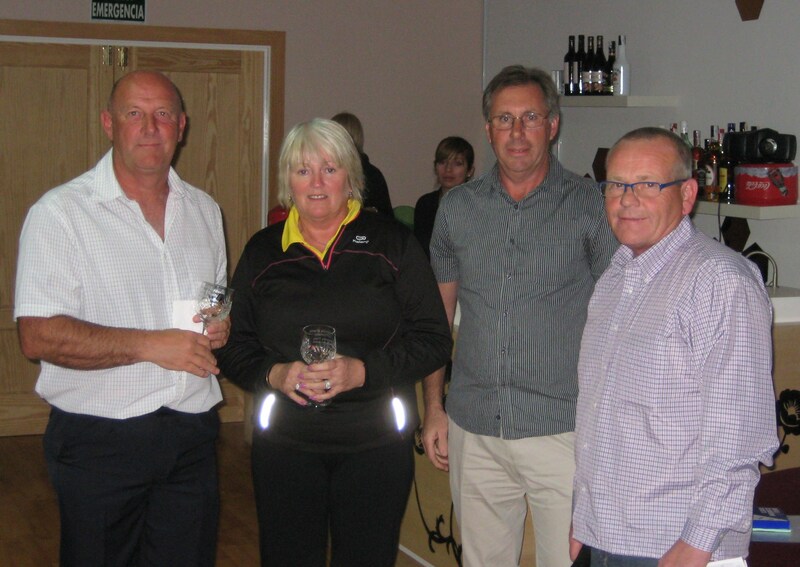 The comeback was complete, with Peter Reeves winning the match 3 up to give Kevin’s team a 4 hole win overall, 63 – 59. 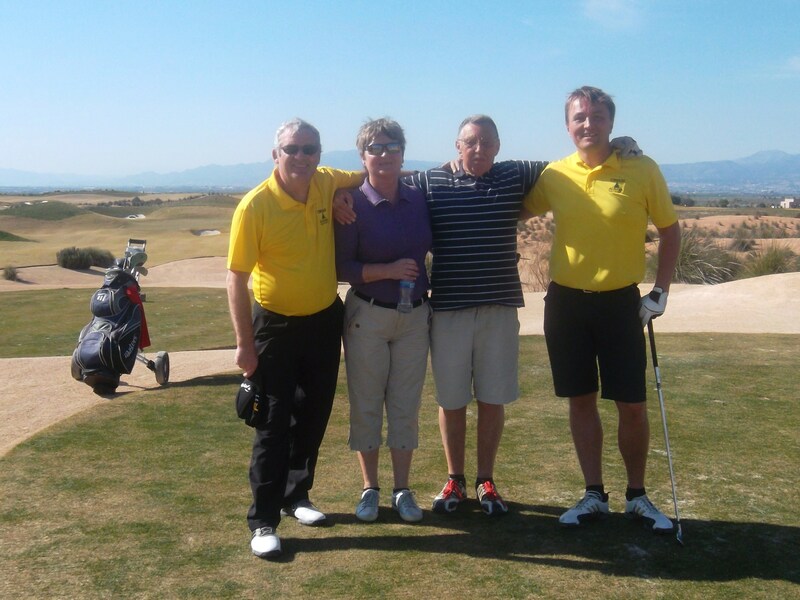 The day was fantastic with everyone enjoying the team atmosphere and the matchplay format. What was meant to be just a filler-in comp during a quiet period of winter proved to be what will be one of the highlights of the year. At the presentation half of the audience erupted as Cath announced the scores and the the winning team. As I say, even myself and Kev did not know the result, only that it was close. the winners look very happy……. After the presentation all players were entered in the free draw, and also we had a sale of unwanted golf equipment which gave bargains to some. We will repeat it for next Friday only, if anyone has unwanted equipment for sale. Last years sponsor Mark Hudson has just done me a great deal on a gap wedge. If there is anything you need just contact him at sales@golfdealers.co.uk (website golfdealers.co.uk) and you should get a society discount. 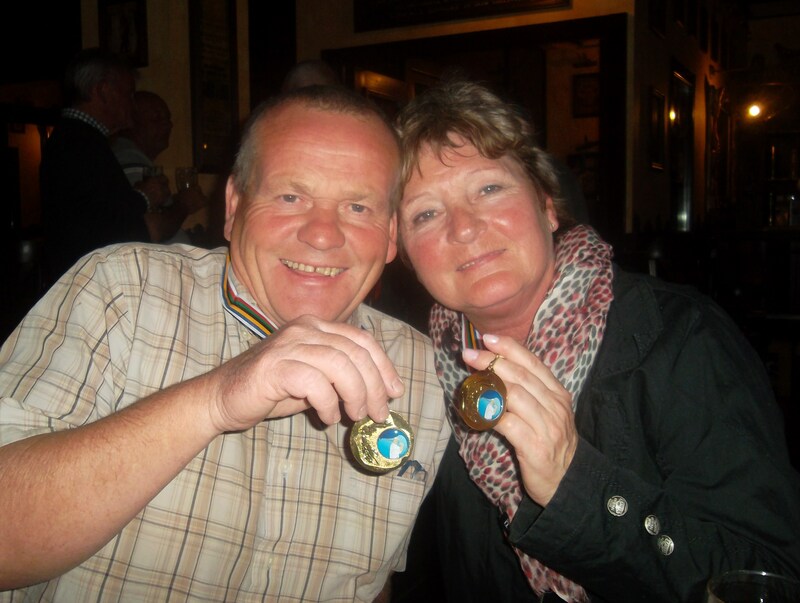 Phone 01332 725139 or 07870574004.
kev and astrid show off their solid gold medals……..
Next week is the March Apollo Air individual stableford competition. Don’t forget that the AGM is only 10 days away (Wednesday March 6th 7 for 7.30 in the Condado Club). Start sheets are in the shop for the Global Golf, St Patricks Day and Graham White pairs (major event). Please note that due to Global Golf changing the dates of course maintenance (hollow tining) we have had to change the date of the Seve Trophy. It was scheduled for Friday May 10th, but will now be brought forward a week to Friday May 3rd. It is for charity, and there will be various fund raising events on the day with excellent prizes. 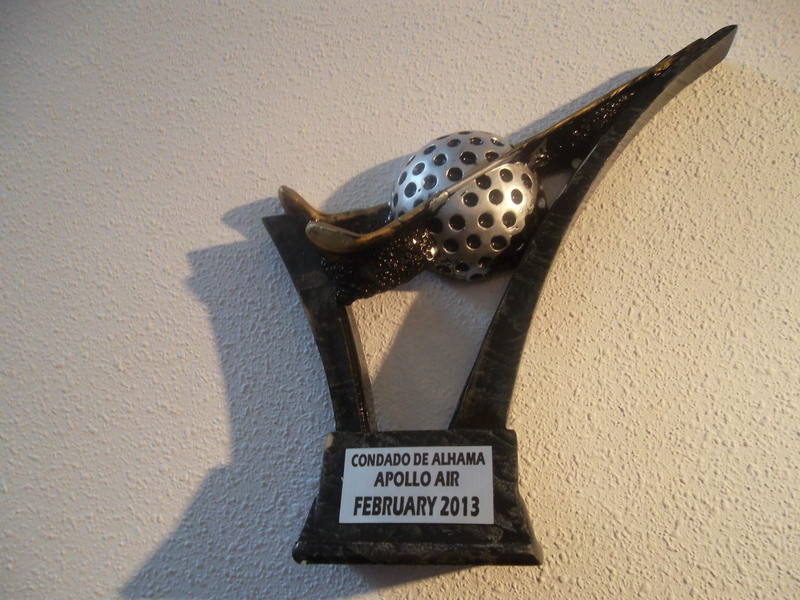 We will again be offering sponsorship of each hole (20 euros) and are looking for a main sponsor (200 euros). They will get hole sponsorship, blog advert, many mentions between now and then and be involved in the presentation. 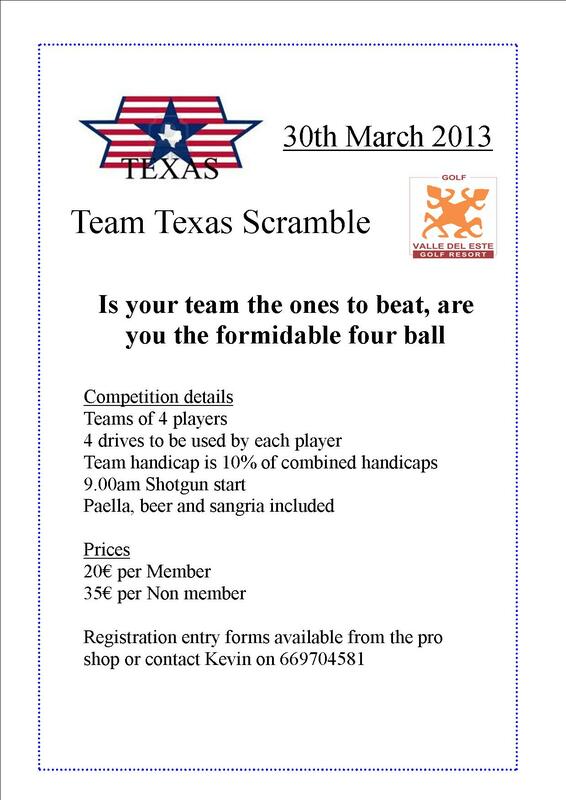 Please contact any committee member or Paul Briggs who is taking responsibility for the event (paul@cdagolf.com). The venue for the evening presentation will be announced later. The railings protecting the path from the driving range to the clubhouse have been completed this week. easy access between range and clubhouse now…. 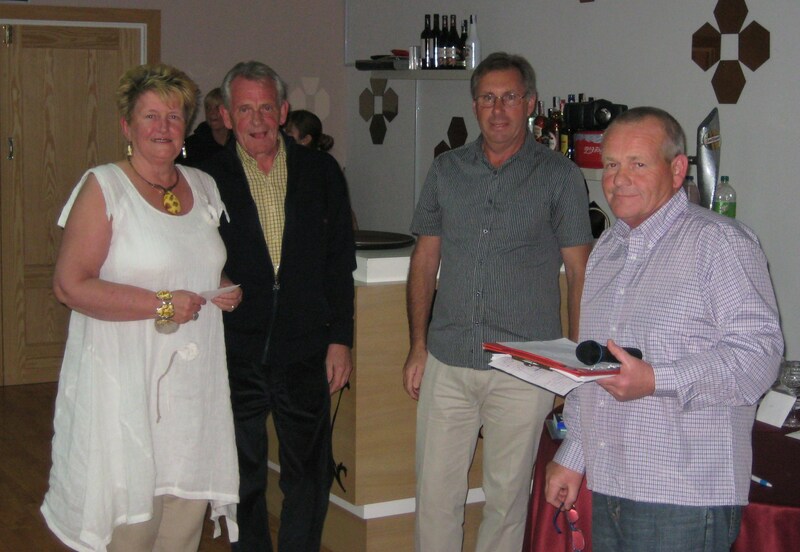 John McFall, Astrid Spieler, John Pitman & Gert Willumsen were not near the prizes but still enjoyed their day….. 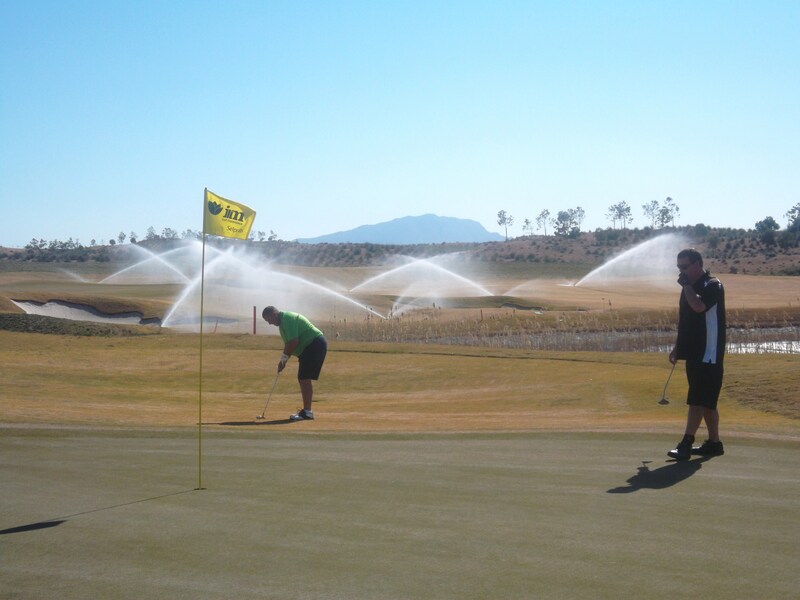 It is noticeable that many areas of the course are now being watered. Also the path from driving range to clubhouse is completed. It only remains for safety rails to be installed alongside the path. The rules night presentation scheduled for Monday night at the Condado Club has been cancelled. Javier cannot do it for some unknown reason (which was out of his hands), so apologies to all those who intended to attend. Next week is the annual challenge match between the teams representing the Captain and President. The format will be pairs matchplay and pairings will be drawn next Wednesday. 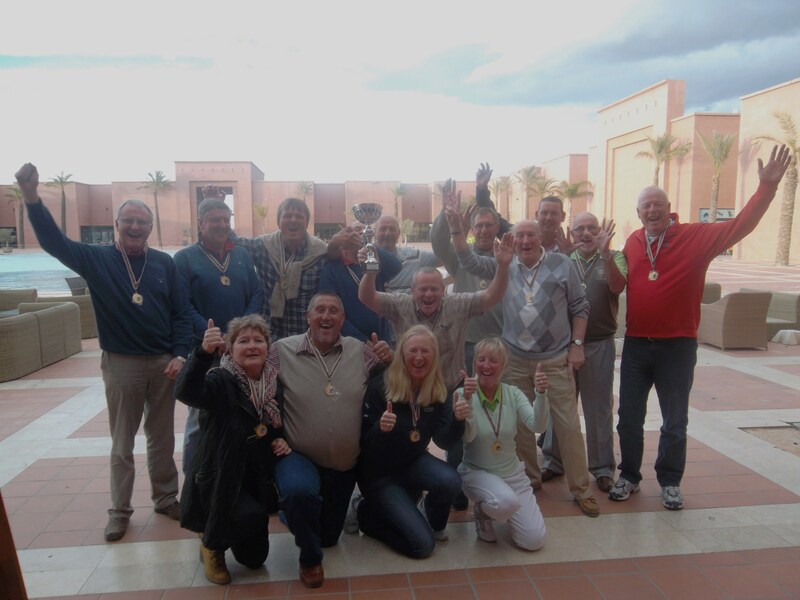 Current holders are the Captains team – here’s hoping the President will triumph this time! There is a team trophy and medals for the winning players. Also next week we will try a new venture – a bring/buy/swap of unwanted golf equipment (clubs etc.). So come down to the Clover after the presentation (about 5.45pm) and have a look. Entry sheets are also on the board for the Global Golf trophy: St Patricks Day; Graham White pairs strokeplay. This week was the February Apollo Air individual bogey competition with players trying to get pluses rather than minuses (plus is better than par, minus is worse each hole). The wind was again a problem for the later starters. We again had a very good entry of 54 competitors. At last! 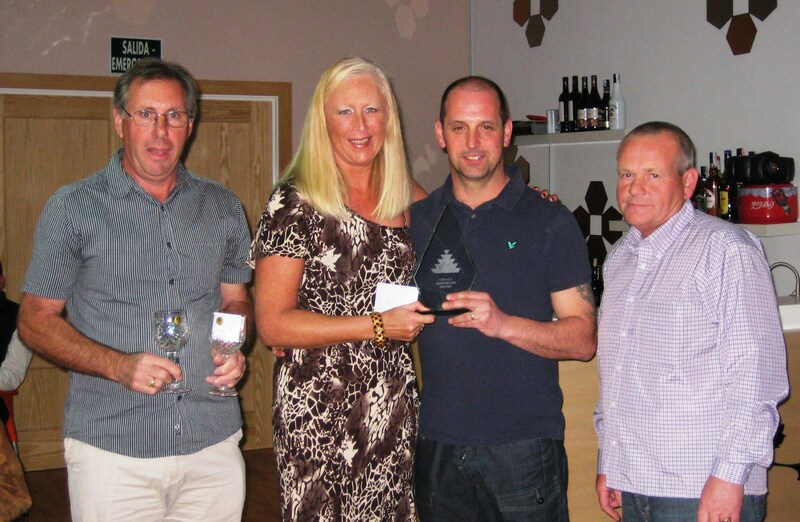 My 1st Apollo Air trophy!……..
Mark came out top in division 2……..
Eli won the ladies prize……. On the par 3 7th, my 2nd shot lay 1 foot from the pin…. Les Hurren thinned his 2nd from the waste bunker on the left, and as it was racing across the green it struck my ball full on and knocked it down the slope. Les’s ball meanwhile stopped almost dead, and he holed the putt for a plus! Poetic justice prevailed, however, on the 9th when from 10 yards short he managed to putt off the green in varying directions with his next 3 shots! The committee have arranged a rules and etiquette night on Monday February 18th 6 – 8pm in in the Condado Club. 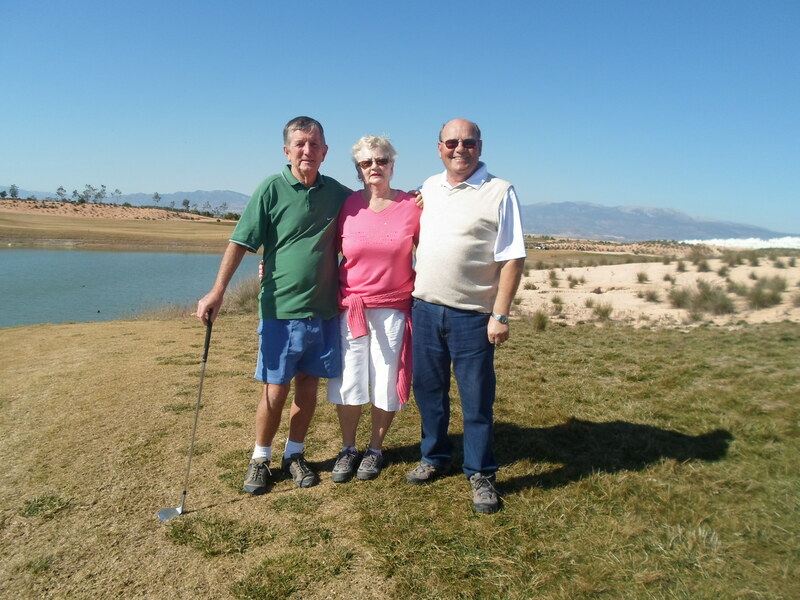 This will involve a slide show and explanations from Javier Garralon, who is the global golf professional responsible for Condado de Alhama. I am sure it will be entertaining and enlightening for us all – we may think we know the rules, but it will be surprising what we don’t know! Everyone is invited whether they are a society member or not, and the cost of the evening will be borne by the society. The course was closed for 3 days this week to accomodate the Evolve professional tour event. Unfortunately, the weather played havoc with the tournament with only the 1st round being completed. Only 4 holes were played both Wednesday and Thursday, with strong winds making play impossible. One example was a ball settling 6 feet from the flag, and by the time the players reached the green the wind had picked it up and taken it 40 feet away! 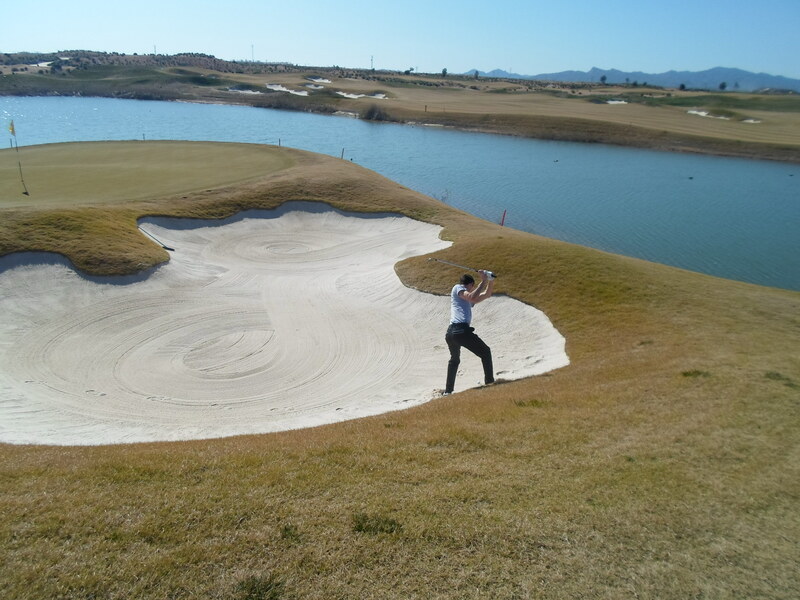 a really tough bunker shot on 11…..
perfect position at the top on 15?…..
not quite a tap in but in she goes for par…..
fred is ready at the 11th to give bunker lessons if required…….. The Graham White pairs strokeplay major event scheduled for April 5th has now been rescheduled for Friday March 29th (the pairings will be drawn out on the Wednesday). This is because the times for the 5th have been taken by another society. No problem though, as the new date is Good Friday and a big entry should be guaranteed. The evening presentation will be in the Bistro Bulgaria (Al Kasar) with live entertainment. 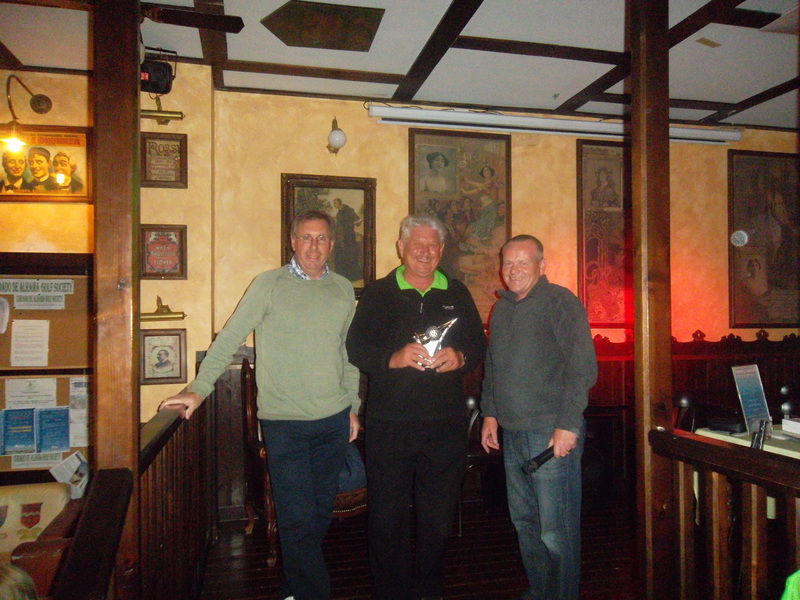 The Global Golf trophy will be played on Monday March 4th, and St Patricks Day special event is on Sunday March 17th. (entry sheets are now in the shop). An Irish night of entertainment will follow in the Clover. I will try to give members information on offers from neighbouring courses, when I receive details. 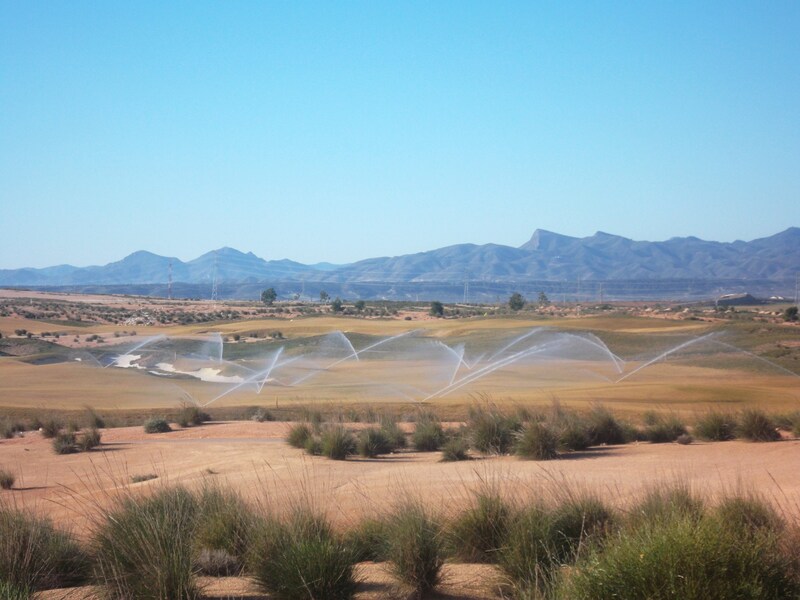 The texas scramble at Valle de Este seems a good deal. I have played this course and found it to be a stiff test but very interesting, and well worth a visit. 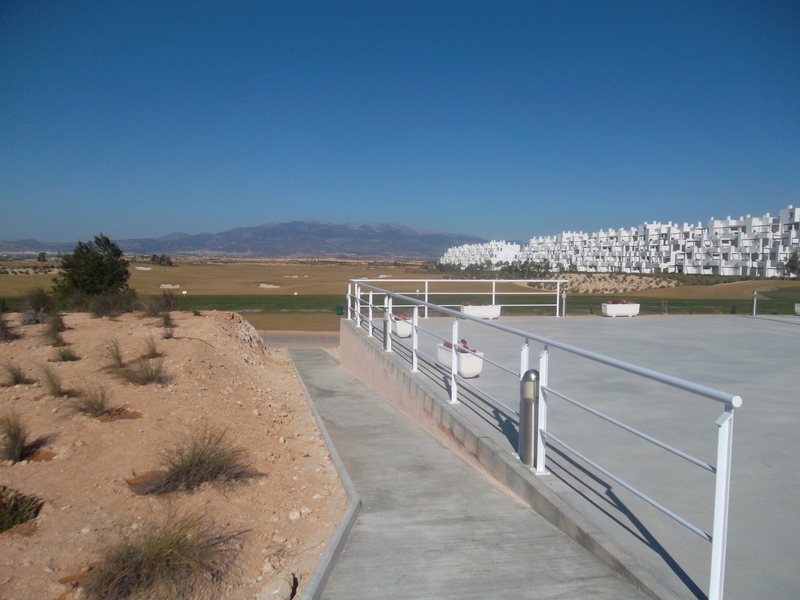 It is in the area of Cuevas de Almanzora (Almeria) and is quite close to Desert Springs and so should be just over one hour drive. Sorry for the delay, but we finally managed to make the members draw for December and January. 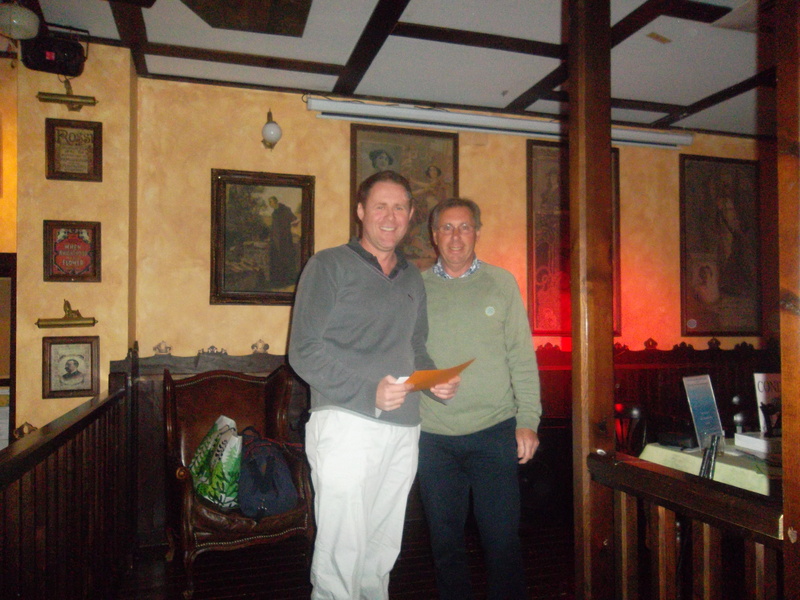 The winners were Jostein Landsvik (56) and Tony Walsh (398). Next week is a 4 person waltz. 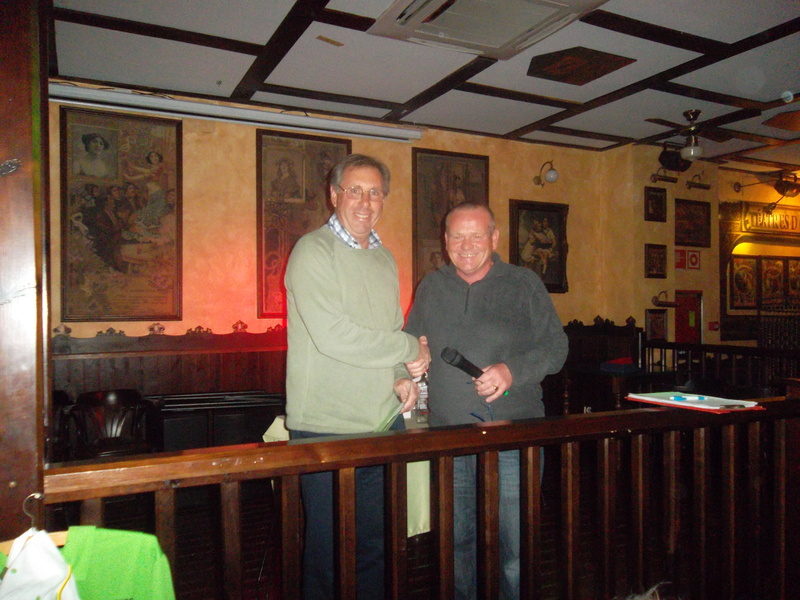 a sell-out at the condado club……. The 1st major competition of the year got off to a great start with warm sunshine and a manageable breeze. Again we were lucky with gale force winds forecast for the following day. The 64 entrants were drawn into pairs by handicap (high and low played together). 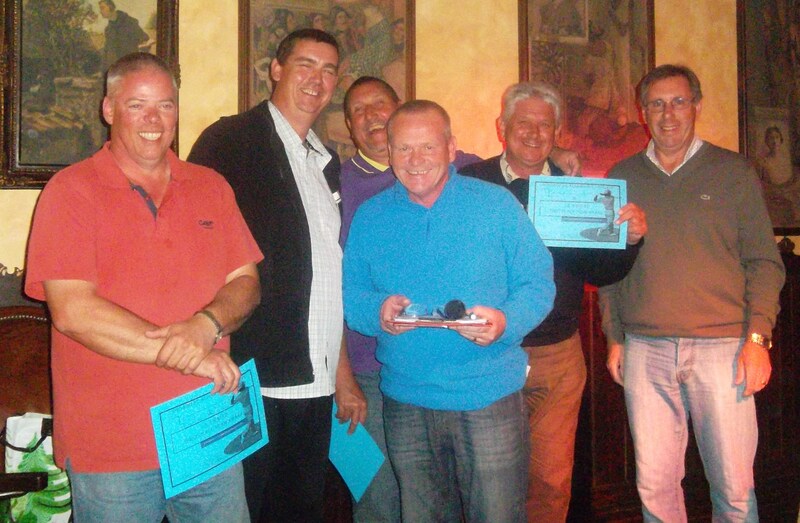 Also we had 5 non-eligible players who played a singles stableford. I can only think that the details provided in the diary and this blog makes players aware of the key dates, as numbers were nearly double last weeks entry. 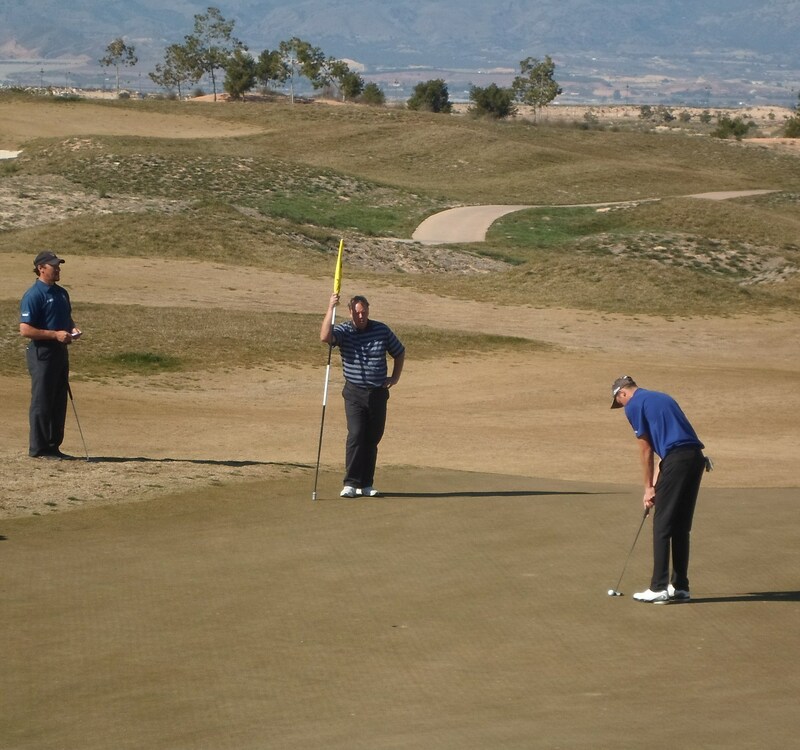 Apart from the main competition there was a putting competition on the practice green, with a very stiff test set by Dave – Sandy Simpson was the only successful putter. 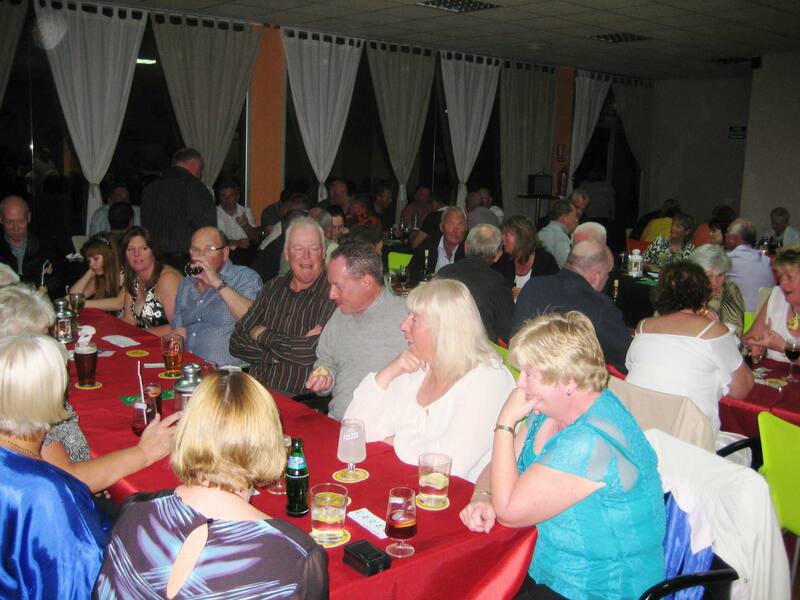 The raffle, putting comp and donations raised a total of 430 euros for our chosen charity this year, CPR. 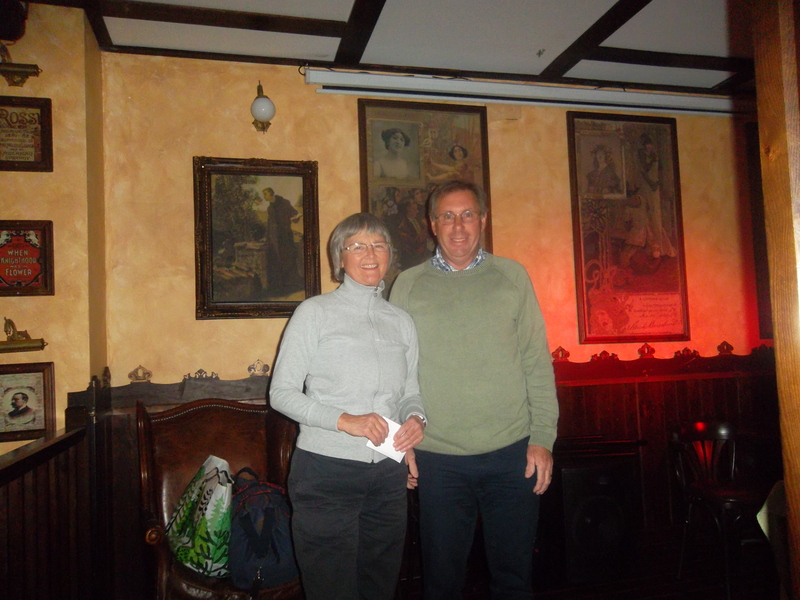 runners up….. but dave and roisin both won nearest the pins…..
Juia with Jim… she also won the longest drive…. 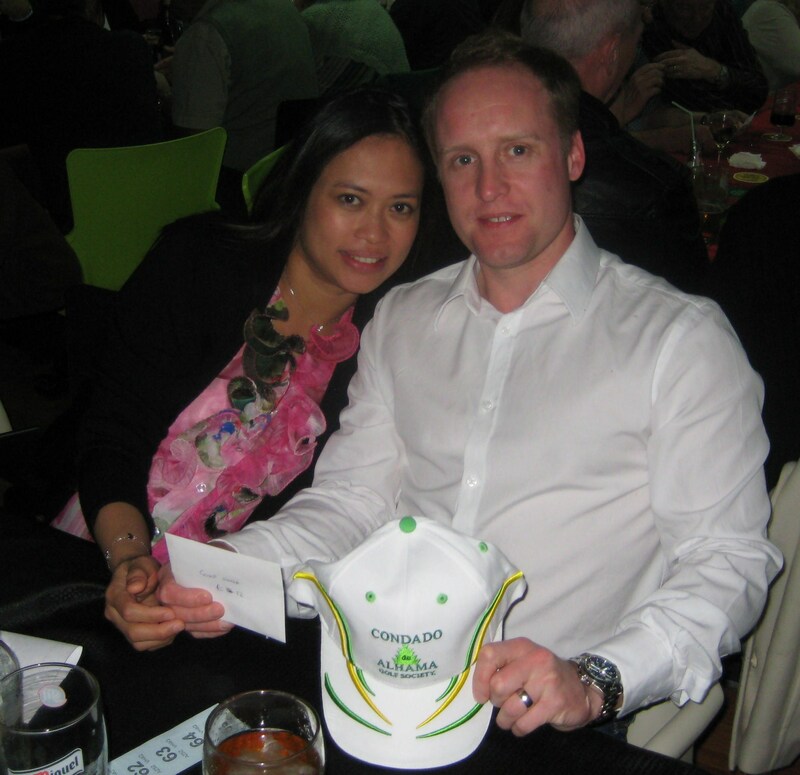 mark barry was the winner of the guest prize…….. Many thanks to Alicia who provided the photos. The evening presentation was well attended with the event being sold out (remember for future events if you want make sure of a place). The path from the driving range has been finished and adds the finishing touches to the clubhouse area, which has proved to be very popular for post game drinks on the terrace or rooftop balcony. I had a lesson this week with the Global Golf professional, and if anyone is struggling with any part of your game I suggest you give him a ring and he will sort you out. After many months of struggling with greenside bunker play, he not only explained the theory but analysed my faults (many!) which I was unaware of. It is a small price to pay for more enjoyable golf in the future. 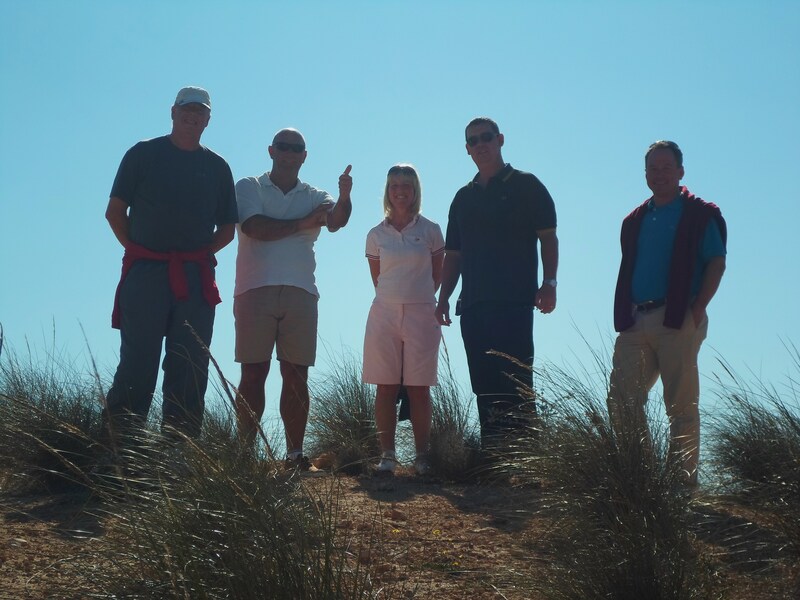 Last week one of our norwegian friends, Georg Gade, holed out at the 7th hole with a 22 degree rescue wood. Congratulations Georg – maybe I will have those 2 shots back! Next week is the Apollo Air individual modifed bogey competition (+/- to par on each hole).